Nice event to start the season, 6.75" and still coming down- unfortunately the gridlock it caused for those on the roads will not soon be forgotten! Horrible! Close to 7" now. Trees are coming down under the weight. Still lots of leaves in the city. Turned out to be a crippling snowfall, thanks to the snowfall rates, timing and overachieving. There is no cars moving anywhere around here. Epic gridlock and standstill highways. Public transit might as well be non existent. 2nd heaviest Nov snowfall in NYC history. Took a little over an hour to go under 5 miles at 2:30 today (Cedar Knolls to Parsippany - routes 10, 287, and 46). Took my husband over 3 hours to get from Hudson County to Parsippany starting also at 2:30. Friend got on the road at 3:30 in Parsippany and still hasn’t gotten to Clifton. The roads are horrendous and a total free for all. Hoping they actually clean everything up before the morning commute. Final tally here just about 5”. It took me two hours to drive from Pequannock to Parsippany this afternoon. I left Pequannock at 2:45, not much snow. An hour later, I was still on 287, and had to crawl, the snow was so deep. After another hour, I was finally home, having passed numerous stranded cars on Route 10...I almost made it home but got stuck about 2 blocks from my house, along with 2 other cars. We all helped each other push each others cars out of the snow. 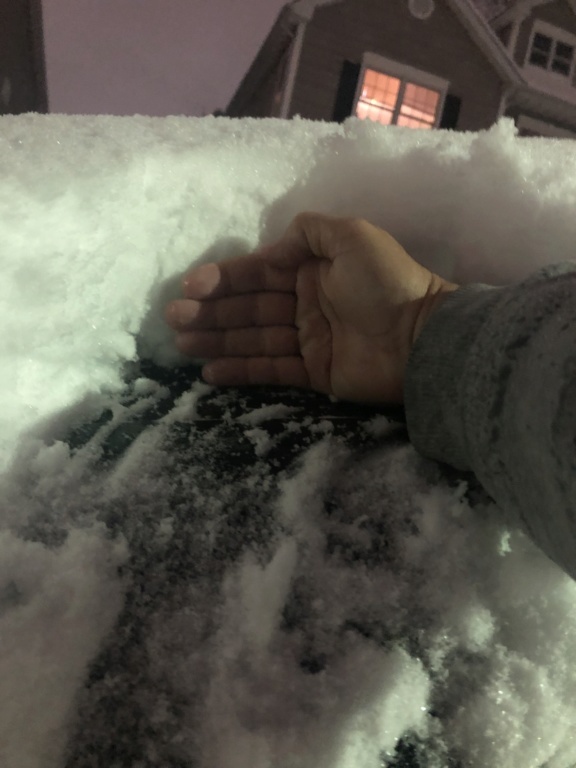 When I finally got home, I spent an hour shoveling about 6 inches of wet concrete (sorry, too tired to measure accurately). The plow has still not come down my street. I haven’t had to drive through snow like this in at least 20 years! Central Park's 6 inch snowfall makes this NYC's biggest November snowstorm since 1938. Just measured on my deck and it is exactly 6 inches. But it seems to be sleeting now, so perhaps I had slightly more an hour ago. 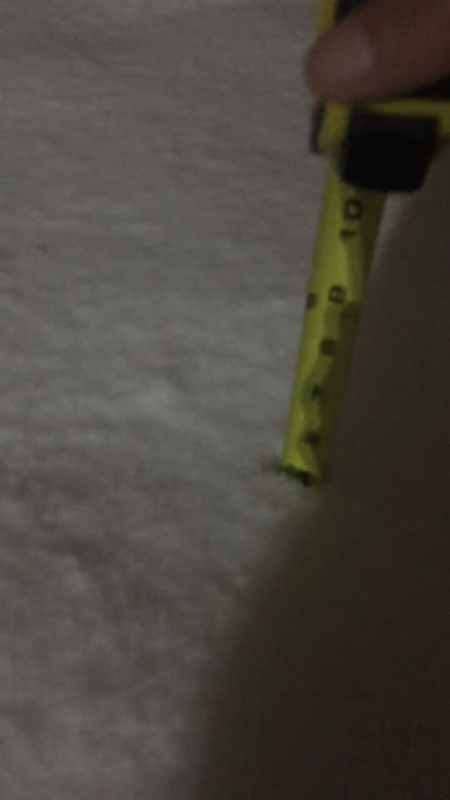 7.3 inches as of 7 PM, not bad Doc if you're out there, can we make 10? I was expecting 5-7 so anything from here on in is icing on the cake. 6.0 inches in Central Park at 6:40, beats the 4.7 from November 6, 2012 post Sandy storm, although Queens saw 8 inches from that storm. Glad to see they measured accurately for a change. It's encouraging but as always we must keep up our guard. syosnow94 wrote: Final tally here just about 5”. It only counts as three when you cut off the bottom two inches of the tape. CPcantmeasuresnow wrote: 7.3 inches as of 7 PM, not bad Doc if you're out there, can we make 10? Wow CP, that's a nice number and we busted high on this one.Let's hope this pattern stays all winter, busting high area wide for the whole board.Gonna wait for the trained spotter total, at my advanced age of 68, don't like to go out on snowy nites to measure,lol. Took 2+ hours to drive from McGurther airport to Smithtown. Thank god for the generator I lost power at 5:30 and their estimated power back on time is 5:30am. Crews are already on the block but I saw 2 trees on the lines on my street. I hope to wake up tomorrow to find this whole mess to be just a memory. Quite an event to say the lease. I went to Central Park after work to measure the snow. My battery on my phone went out so I couldn’t see what the Conservancy had until I got back to my apartment. I measured near the turtle pond about an hour ago like I did last April as it was untouched. It was sleeting and I picked up a measurement of just over 6 inches. As it turns out the 6:20 PM measurement was at 6”. So my measurement seems consistent with what they have. I wonder if they’ll add on the sleet that happened after 6:20. Also, my block here on the Upper East Side has plenty of down tree limbs. Gives flashbacks to those early season snowstorms in 2011 and 2012. Math23x7 wrote: Quite an event to say the lease. I went to Central Park after work to measure the snow. My battery on my phone went out so I couldn’t see what the Conservancy had until I got back to my apartment. I measured near the turtle pond about an hour ago like I did last April as it was untouched. It was sleeting and I picked up a measurement of just over 6 inches. As it turns out the 6:20 PM measurement was at 6”. So my measurement seems consistent with what they have. I wonder if they’ll add on the sleet that happened after 6:20. Also, my block here on the Upper East Side has plenty of down tree limbs. Gives flashbacks to those early season snowstorms in 2011 and 2012. Interesting lots more trees up here and no tree damage, wind is very gusty now too. 6" here in mt. Vernon. very nice surprise and a good start to the winter season. still sleeting mixed with snow. awful driving took 2hours from white plains to home. Barnegat, NJ in southern ocean county along the coast is a strong gusty wind, heavy rain all day long. Friends up north enjoy your white gold.....Hopefully I can join you sometime in December.